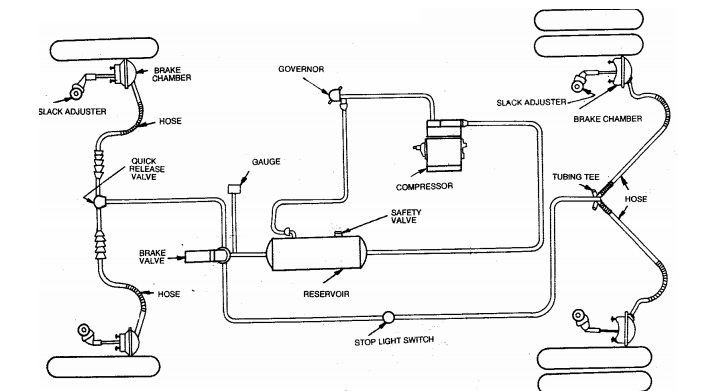 An air brake or, more formally, a compressed air brake system, is a type of friction brake for vehicles in which compressed air pressing on a piston is used to apply the pressure to the brake pad needed to stop the vehicle. Air brakes are used in large heavy vehicles, particularly those having multiple trailers which must be linked into the brake system, such as trucks, buses, trailers, and semi-trailers in addition to their use in railroad trains. The air brake system consists of two-stage air-compressor driven by the crankshaft or gearbox shaft. It takes air from atmosphere, compresses it and delivers to the air reservoir through un-loader valve. Where the pressure of the reservoir reaches the maximum degree, the un- loader valve opens to the atmosphere. Then the compressed air is directed in to the atmosphere directly. Each of the four wheels fitted with brake chambers consists of a diaphragm, and which the air pressure is applied and pushes it. This force operates the cam actuating lever and applies the brake. Each of the brake chamber is connected to the brake pedal, and air filter is also fitted between the brake valve and reservoir. When the brake pedal is pushed the brake valve opens and compressed air is allowed in to the brake chamber. The brake valve consists of three passages. When the brake pedal is pressed the exhaust passage will be closed and Air intake passage open and compressed air goes back to the chamber. During return stroke the exhaust passage opens while intake closes and used air goes to the atmosphere. This system fitted with an emergency mechanical brake, which can be used when air supply fails the air brake system, which is called air assisted hydraulic braking system. 1. This system used in heavy vehicles because they are more powerful than hydraulic or mechanical brakes. 3. The compressed air is used for purposes like tyre inflation; for horn, windscreen wiper etc. 1.If there is any leakage in passage the entire system will be fail. Therefore sealing of air is very difficult. Types Of Mechanical Keys- Design Of Keys. This is a very nice post. This is very informative and helpful blog. Thank you for sharing this post. Thank you for sharing about the working details. Hope your next post will published soon. « Types Of Mechanical Keys- Design Of Keys.